Kindergarten Vacation Snack packs are ready to go. Please pick yours up in the Corinna Elementary Office by Friday at 3:00pm. Literacy Night for Corinna students at Sebasticook Middle School TONIGHT 6:00pm. See you there! Early Release March 14th. Students will be dismissed at 11:30. No school Friday, March 15th. Kindergarten Snack Packs are here. Please pick your child's bag up at the school by Friday. If you do not want your snack pack, please call us at 278-4263 and let the office know so we can donate it to another family. Today, Wednesday, December 19th, is an early release day. Students will be dismissed at 11:30. The Corinna PTF Trunk or Treat scheduled for Saturday, October 27th has been canceled due to incoming weather. The event will now take place on Halloween from 4:00pm to 6:00pm. See you there! We have an early release day this Thursday. Corinna dismissal starts at 11:40. There will be no school for students on Friday, October 5th. A test of the national emergency public alert system will happen tomorrow at 2:18. This is only a test and will not impact students. Welcome Back! Doors open at 7:40 tomorrow. Dress in your summer clothes. It’s going to be a hot one! The FOURTH grade celebration is at 9:00 today. School will be dismissed at 11:30. Have a great summer! The Corinna PTF is hosting a Family Dance tomorrow night, Saturday, June 2nd, from 5:00-7:00 in the gym. We hope to see you there! Wednesday, May 16th, is an early release day. Dismissal will begin at 11:30, and there will be no after school tutoring. Corinna Elementary will be having our Family Literacy and Math night on Tuesday, April 24th from 5:00 to 6:00pm. We hope to see you there! Parent teacher conferences for today, Tuesday March 13th have been rescheduled for Tuesday, March 20th. Tomorrow, 3/13 is the very last day for pizza orders and money. In addition, we have an early release day on Thursday. Walkers will be dismissed at 11:30. There will be no school on Friday. Please note: Community helpers are coming to greet our students this week. You will see police and fire vehicles at the school on Monday and Tuesday morning. This is a message from Corinna Elementary. Please turn in Jump Rope For Heart donations by tomorrow (Thursday, Feb. 15) so that we can order our thank you gifts for the students. Have a good night! Wednesday, February 7th is an Early Release Day. We will begin dismissing students at 11:40. PTF Wacky Day has been postponed to January 24th due to the snow day. Wear your PJs on the 24th! PTF Wacky Day is tomorrow, January 17th. Wear pajamas and bring slippers! 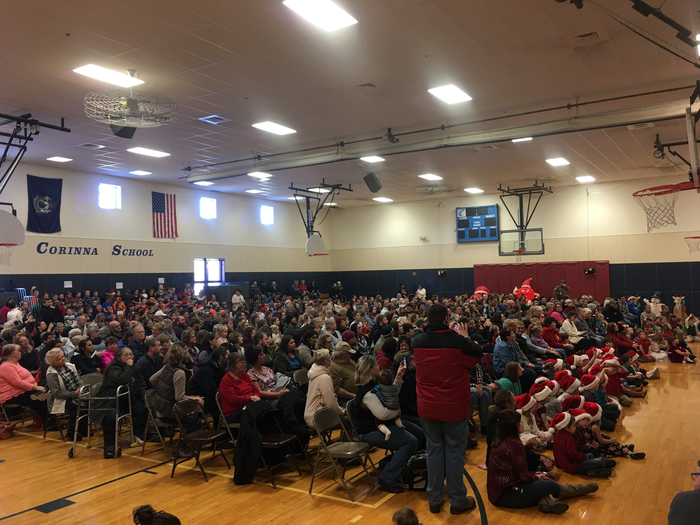 Everyone is ready for the holiday concert to begin! Our annual Corinna holiday concert, for grades PreK-4, will be at 1:00pm on Friday, December 15th in the Gym. On Friday, December 8th Corinna Elementary Students will take place in the "Giving Tree" Community Service Project and will decorate their town tree. Please dress for the weather and wear comfortable, safe shoes for walking.